Let’s Race! 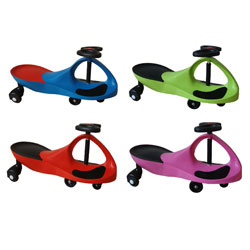 Kids will love these Plasma Cars as they race their friends. The Original Plasma Car is an innovative, ride-on toy that harnesses the natural forces of inertia, centrifugal force, friction, and kid power. No batteries, gears, or pedals. Patented safety seat design places rider in a safe, comfortable position and minimizes tipping. Use indoors or out on a smooth, flat surface. Great for children over the age of 3 and adults up to 220 lbs. A unique item that is great for any event. This item comes with 4 Plasma Cars for all the children to enjoy.